I've been dying to get back to Charleston for ages. It seems every time you turnaround you hear about all the ridiculously good eats people like Sean Brock and Mike Lata are dishing out in Charleston, so I orchestrated a family trip up recently to see (and taste) for myself. With just 125K people and small town charm to spare, you wouldn't expect to have such an abundance of choices at all price ranges, but Charleston in fact has an enviable roster of world class restaurants. After much researching, I selected Husk (natch! ), The Ordinary, Hominy Grill and Xiao Bao Biscuit. Husk generates more buzz for Charleston than any other spot. 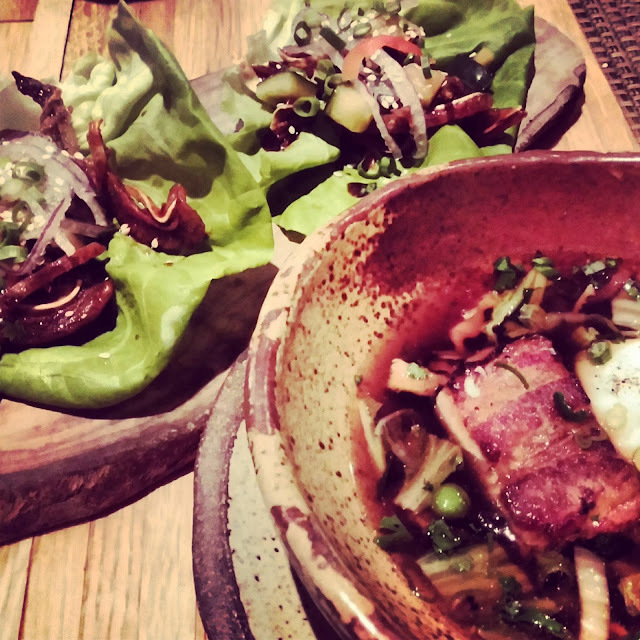 Sean Brock is a chef's chef, and you always hear about his hyper local approach. I worried that with such high expectations, it wouldn't live up to the hype, but thankfully I was wrong. The setting is elegant, and the service gracious. I especially liked that the server gave me the straight scoop when I asked whether the steak on the menu that night was a must-have or the option for the non-adventurous (it was the latter). My favorite dish of the night turned out to be one we didn't order. They were kind enough to offer us a taste of the crispy pigs' ear lettuce wraps from that day's lunch menu, and they were the business. Imagine the best bacon you've ever had, and you'll get an idea of what Husk's crispy pigs' ears are like. Another favorite was the duck confit, which was full of rich, fatty flavor. It's a must order if you're lucky enough to spot it on the menu when you go. Charleston is as genteel Southern as it gets, and Hominy Grill is the perfect choice for classic Southern dishes. Jalapeno hushpuppies, fried chicken and she-crab soup were exactly the type of regional cuisine you fantasize about when you think of Southern food. The meal was heavy for sure, but worth every crispy fried bite! 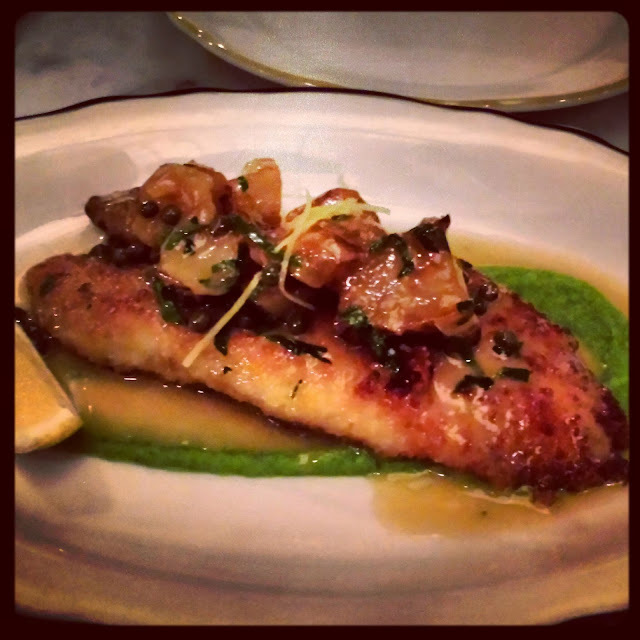 Mike Lata's The Ordinary is an oyster house in an old bank. The space is grand and chic, perfect for a date night. It's Charleston's version of Atlanta's much heralded Optimist, and dare I say it? I think I prefer The Ordinary. Every single bite of food that passed my lips was heavenly. Now that's saying something because I'm not even that into seafood. A selection of raw oysters were plump, briny little gems. Fried oyster sliders served on sweet little buns with a spicy slaw were perhaps the best I've ever had. The soft bread imparted an almost tropical flavor that balanced perfectly with the spicy and salty flavors of the slaw and lightly breaded oyster. I could eat a whole plate of just these. An amberjack schnitzel was also incredible. I've had seafood schnitzels before, and they were good, but this was remember it for years to come delicious. I especially loved the tangy lemony sauce and the just right crispness of the fish. Asian food in Charleston? Yes, I almost missed out on this hotspot because I was so dubious of it. Fortunately, we trusted Bon Appetit's raves and checked out this no reservations restaurant housed in an old gas station and found it to be hipster cool and surprisingly tasty. They offer a melange of Asian cuisines with dishes hailing from Japan, Thailand, China and Vietnam. The food is frequently fiery, to the extent that I couldn't eat as much as I might have liked of some dishes (yes, I'm a wuss). 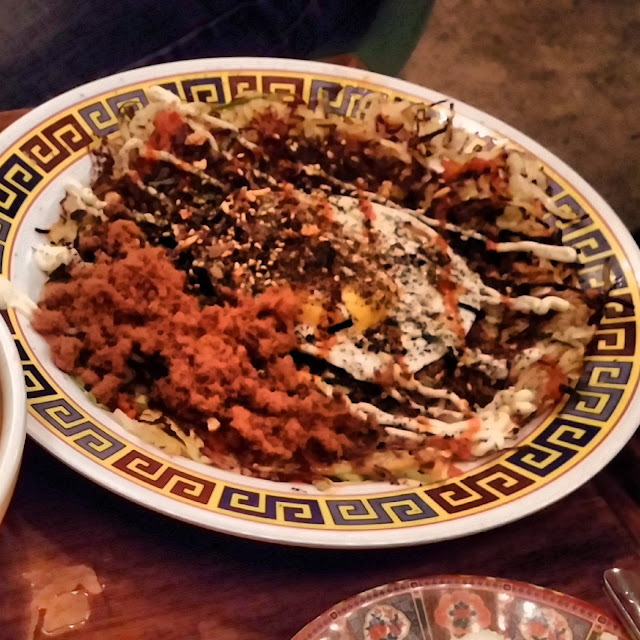 The Japanese okonomiyaki ( a Japanese cabbage pancake) with egg and pork candy was a standout. It's sweet and savory elements were a nice foil to the heat of other items we ordered. The Mapo Wings were sticky sweet and hot and made with broad bean, chili and sichuan peppercorns. I'll take these over run of the mill buffalo wings any day! Despite all of my research, every trip has its disappointments, but I can honestly say that every spot we dined at in Charleston was just as good, if not better than I'd hoped. We considered brunch at the Macintosh on our way out of town, but we were so full that we decided to wait for our next visit. That's saying something considering how good their menu looked. I cannot recommend these restaurants highly enough, and I'm already looking forward to future visits to this lovely culinary mecca!